Teams have relied on Web conferencing for almost a decade - and for more than the obvious reduction in travel. In fact, a recent Wainhouse Research study reveals that teams using Web conferencing have been realizing an impressive range of unexpected hard and soft benefits. 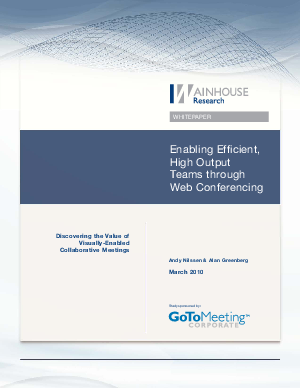 Based on in-depth interviews with Web conferencing users, this new Wainhouse Research white paper explores the value of Web conferencing for catalyzing team interaction and collaboration.